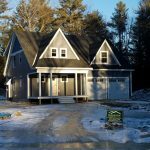 2190SF custom built home in Dover, NH with 3 bedrooms, 2.5 baths and a 3 car garage. Beautiful 2605SF home with 4 bedrooms, 2.5 baths and a 2-car attached garage. The Sweet Peaks model has so much to offer, from it’s alluring exterior to the open concept 1st floor and perfectly sized 2nd floor bedrooms and laundry. A perfect family home in Durham. 2180SF new home on Oak Knoll Lane. This beautiful home and barn/garage with in-law suite above is tucked away nicely on it’s lot in Sandown, NH. Ridgeview has designed a simple, compact, yet perfectly livable home for this family. 1451SF new home on Fremont Rd.